Introduction: "The Iroquois used their environment to meet their basic needs." Part A. Examine each of the following documents and answer each of the questions. The Iroquois have many legends about the "3 Sisters" who would never be apart from one another." Q: Who were the " 3 Sisters?" 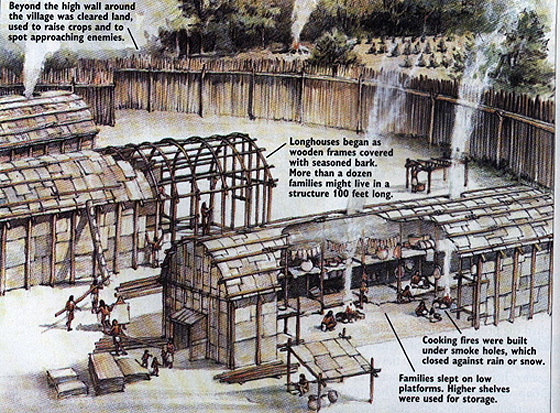 Q: Identify three resources used by the Iroquois to build a longhouse. Q: Identify three resources found in this historic drawing of an Iroquois village. "We did not think of the hills, steams or forests as wild. Only to the white man was nature a wilderness infested with wild animals. To us it was tame." Q: Using complete sentences explain Chief Standing Bears view of nature. "The Iroquois Indians used the pelts of animals for their clothing. In the winter, the men wore shirts, leggings, and moccasins made of buckskin. Buckskin is clothing made from the skins of animals, mainly deer. The women wore skirts they had woven from the wild grasses, covered with furs, with leggings underneath." Q: Name three natural resources that were used for clothing. Part B. Use the documents to write an essay that describes three ways the Iroquois used their environment.